And in an entirely unrelated matter, we’ll have a look at what Baruch Caan and the High Priest are up to when they’re not busy running (or ruining) Catherineborough or defending it from the DUF. I have quite a bit of catching up to do before getting to this chapter and episode. Since I don’t remember exactly where I last left it and also because I wanted to revisit the old episodes anyway, I started reading from the beginning. 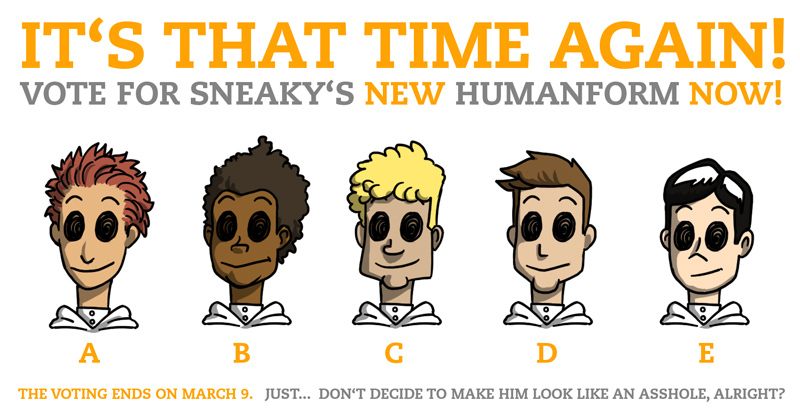 None-the-less, I want to vote on the new humanform of Sneaky. Alternative D.
We’ll continue to bring the awesome! Now I’ve read through all the old episodes. It has been great reading them one after another on evenings/at night.